I made it to the highest point of southern California on Sunday. The weather was perfect, the hiking group was great, I was feeling good, and the views were unbeatable. Probably one of the best hiking days of my life. I thank the mountain gods. Saturday early morning found my mom and me en route to the San Bernardino Mountains. She had never been there before and I wanted to bring her here before school started. We left San Diego around 5:45am with a stop at a coffee shop (name declined to preserve integrity) near UC Riverside to fuel up on caffeine and carbs. After passing through Mentone, we stopped at the Mill Creek Ranger station for permits. The lot was already full with day hikers and cyclists. 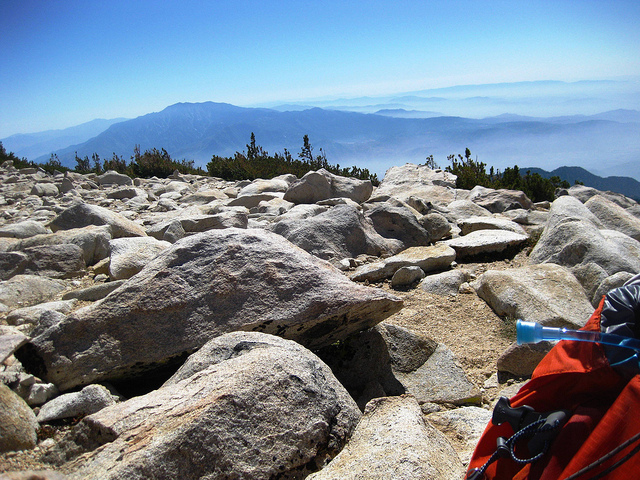 I had no intention of bagging San Gorgonio that day. Instead I planned to take the Foresee Trail which was recommended to me by another hiker. Passing through Angelus Oaks we made a right turn onto Jenks Lake Road. There is a bit of driving on a dirt road, but a high-clearance vehicle is not necessary. The lot was almost full. We started hiking just shy of 8:30am. And it was chilly! The previous week the temperatures in San Diego were in the high 80s-low 90s. I checked the current temperature and it said 55! And with the wind it felt even colder. Fortunately I was prepared as I had my fleece with me, but a thermos of hot chocolate or ginger tea would have been nice. It was a clear beautiful day and the smell of the Jeffrey pines was intoxicating. Despite the lot being full, we only saw 4 hikers on the trail the entire day. With my new GPS (review forthcoming) I was able to keep track of the elevation gain and mileage. The views of the valley, San Gabriel Mountains, and Big Bear Lake were spectacular. When we reached Anderson Flat we stopped for lunch and tried to keep ourselves warm from the chilly wind. I wanted to continue on, but with the 2-hour drive to San Diego, we decided to head back. It was much warmer on the descent. Mom was impressed with the area and even talked of bagging San Gorgonio one day! When we reached the lot I read my GPS and it said we covered 12.5 miles with an elevation gain of about 4,100 feet. We have much training to do before San Gorgonio! 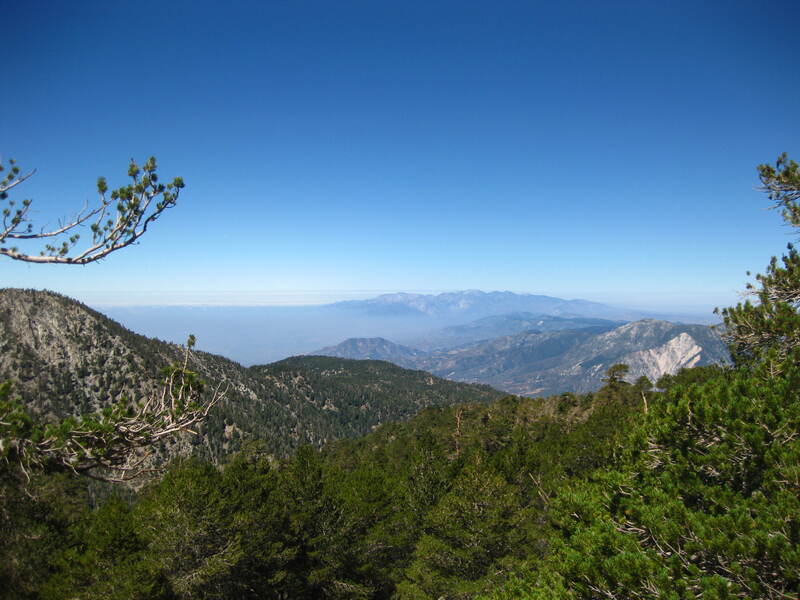 So I signed up for a Saturday hike in the San Gorgonio Wilderness with a L.A. club. This meant an early morning rise and a 2-hour drive to the meeting place, but I was willing to commit as this would be a new trail for me. Fortunately, I had someone accompany me from the San Diego area. By 5:30 am we were on the road and by 7:00 am we were at the Mill Creek Ranger Station in the San Bernardino Mountains. After coordinating cars we caravanned up to the Aspen Grove trailhead. I highly recommend vehicles with high clearance! We reached the trailhead and after pit stops, applying sunscreen and adjusting packs, 17 adult hikers and one baby were on the trail by 8:30. The cool temperatures forced me to keep my fleece on and my hands in my pockets. We passed through the aspen grove, but the leaves were not yet turning to golden-yellow. Still, it was a nice treat to see aspens in southern California, which is a rarity. Kimberly, our leader, kept a brisk pace and stopped a couple times to allow us to strip layers and make pit stops. I loved the gradual ascent of the trail and the accompanying ponderosa pine, Jeffrey pine and Douglas fir trees, which provided ample shelter from the sun. As we approached Fish Creek Saddle, we were greeted by views of the surrounding mountains. 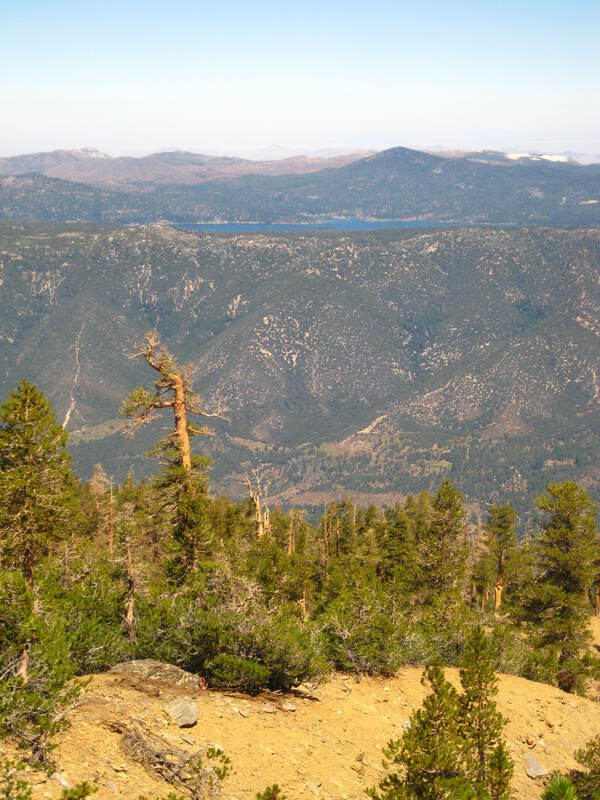 Within 2 ½ hours we had reached the saddle and I was itching to continue on, perhaps to Dry Lake or even to San Gorgonio. We stopped to have lunch and within 15-20 minutes we were cooling up and some of us were ready to head back down to keep warm. The trail did not have a lot of traffic, but we did pass a lot of Boy Scouts on our descent. Returning to the trailhead was cloudy and some of us even wondered if we would see some rain. As for the mileage, there seemed to be a discrepancy. 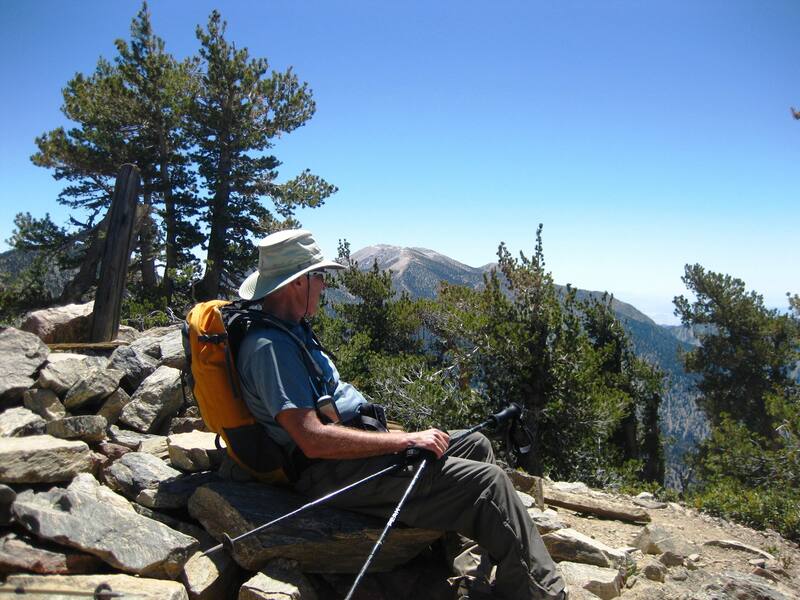 The Tom Harrison map lists 5.8 miles from the Aspen Grove trailhead to the Saddle, but the San Gorgonio Wilderness Association lists 6.8 miles. Hmmm, I think it’s time to invest in a GPS. Overall, it was a beautiful hike with a great group and well worth the drive from San Diego.